July 4th, 2013. An extremely exhausting day filled with so much animu you could literally swim in it. Never been to Anime Expo on its first day before, but I have to say, through nearly three hours of waiting in 90 degree heat to get our badges, the wait was well worth it. Best Independence Day ever. Came this year with two of my other buddies, my comrade in question who bore the weight of Operation Virtue upon our shoulders with me, and another good friend whom I attended last year’s Expo with. The morning hours saw us waiting in sweltering heat for 3 hours in a massive line that, while moved fast, stretched for at least 20 miles. 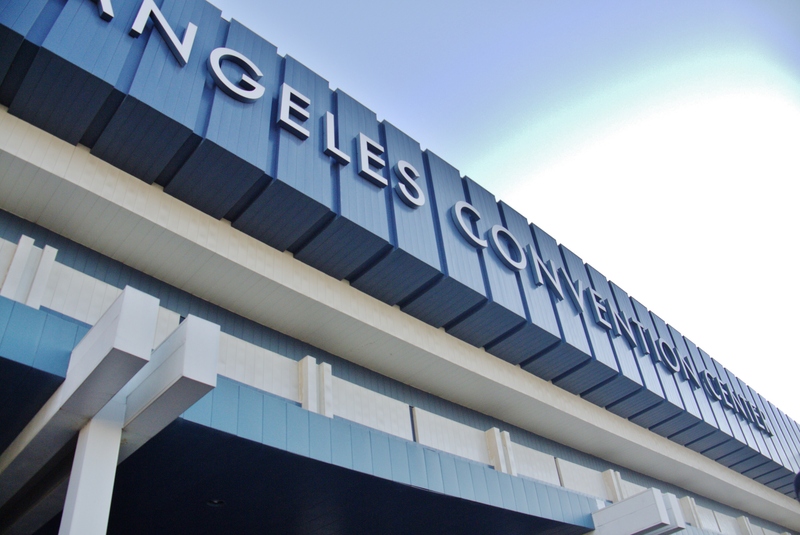 The sheer amount of people at this convention is awe-inspiring, and just a little bit intimidating. Needless to say, Operation Virtue managed to successfully be completed on time for the convention. When we first arrived, the response to the cosplay was amazing. 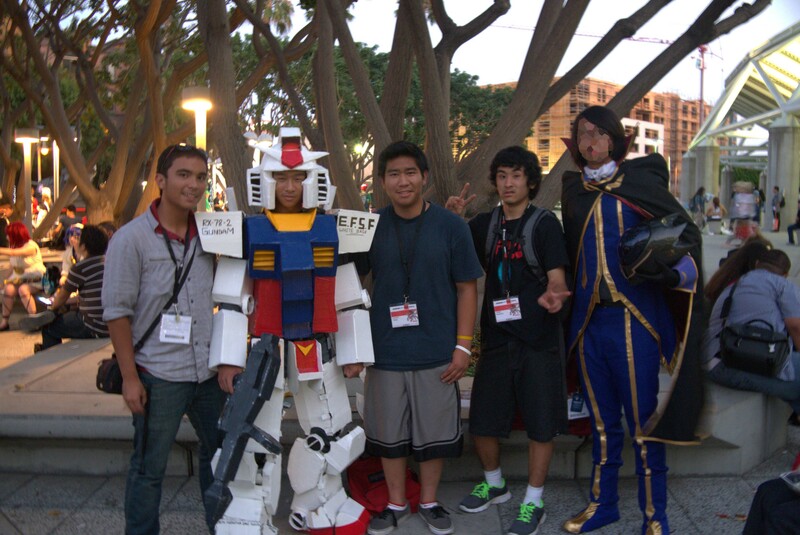 We considered ourselves lucky if we got a request for one picture, but upon entering the main lobby, we were stuck in place as otakus all around gathered to take pictures of the only RX-78-2 Gundam there at the time. Unfortunate as it was, the project was not completely successful the entire time. While waiting in line and donning the armor, the entire thing fell apart at the seams due to the Velcro not being properly attached to the cardboard. Evidently duct tape can hold the universe together but not Velcro to cardboard. 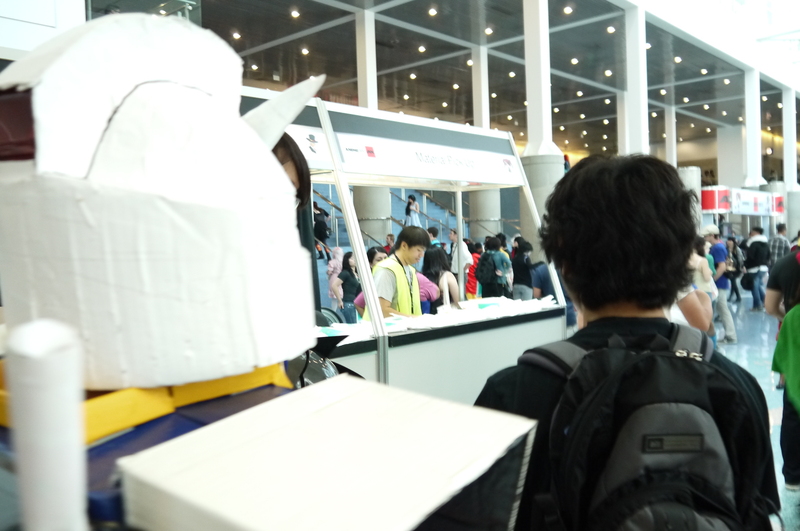 Eventually the entire thing fell off my comrade whilst we waited in the three hour line, but after getting our badges and managing to get inside the air-conditioned convention center, emergency repairs were commenced to fix the armor entirely with duct tape. 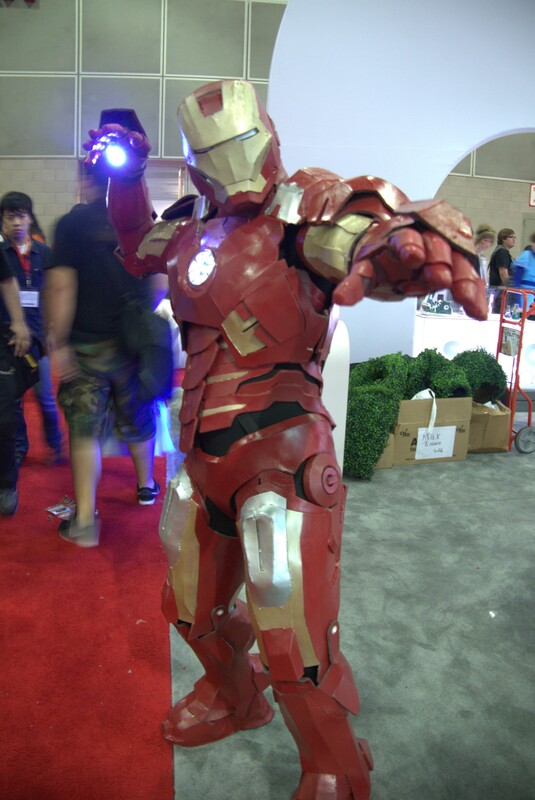 While the side skirts were scrapped, the rest of the armor actually managed to hold up during the rest of the ‘con. Needless to say, fun was had. 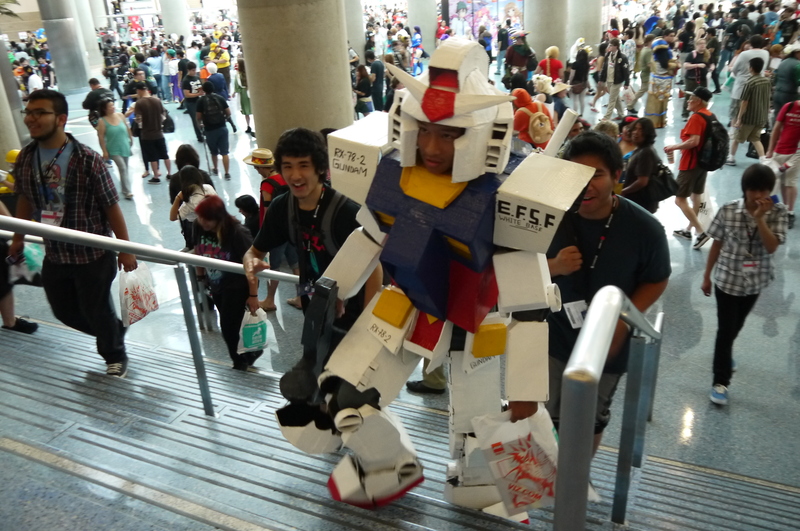 I’ve been to AX many times before, but the sheer amount of cosplay, some of them very astounding and aesthetically pleasing, still amaze me to this day. 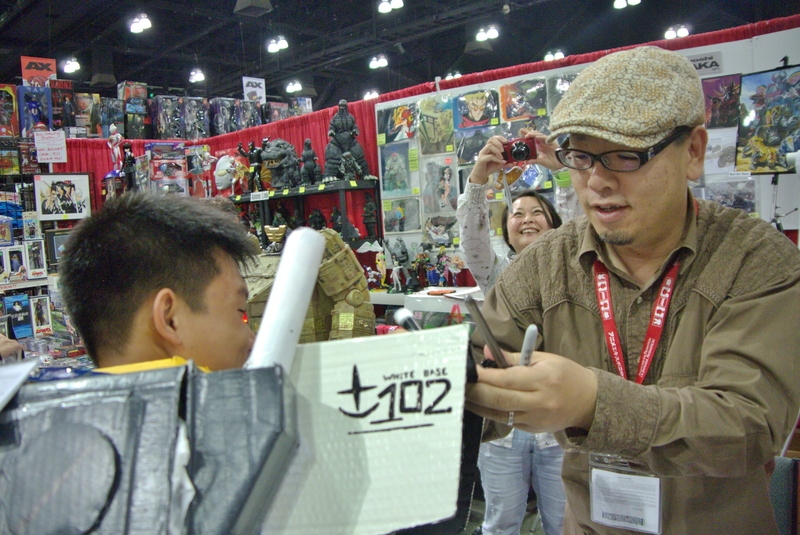 We saw just about every character and every anime known to man represented there. Not a bad sight at all. 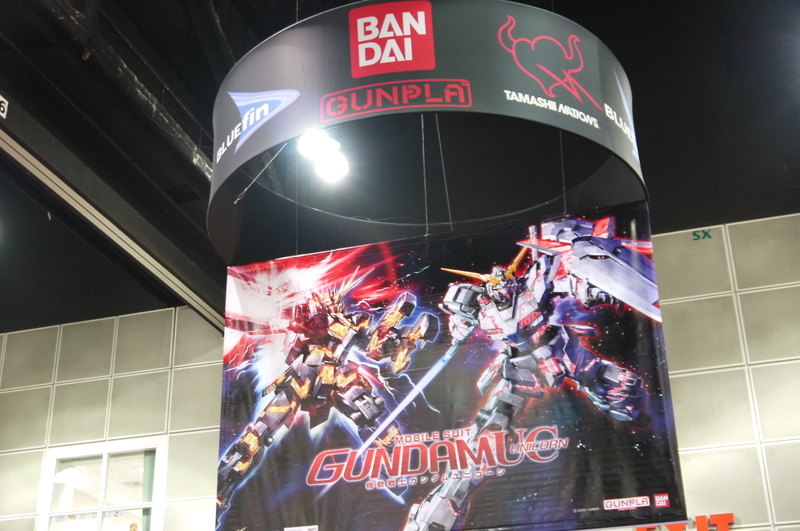 Upon entering the Exhibit Hall, first stop was the official Bandai booth with just about every kit known to man. What astounded me about this year’s displays of ‘pla is that THEY LOOK NICE!! I swear, in previous years all the ‘pla displayed at the convention always looked terrible, mostly due to posing. I don’t blame them for this, since I know setting up a convention can be extremely stressful and difficult under a time table, but I was thoroughly amazed at this year’s collection. Most of the kits looked absolutely gorgeous. 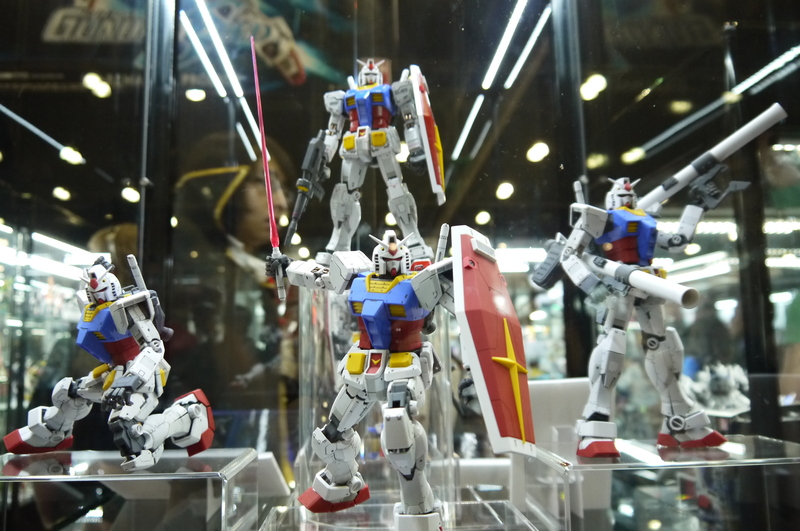 A little sneak peek at the new RX-78-2 MG 3.0. I had originally dismissed it as just an upscaled RG kit, but man…it does look beautiful in person. Man, just…some of these kits. So beautiful. My jaw dropped. I never had a big thing for Perfect Grades, but that Astray…that metallic red…a tear was shed today. There were plenty of exclusive items at the ‘con, including a nice metallic pink Lacus Clyne Zaku Warrior Custom…I’ve owned this kit before, and I have to say, it’s…pink. More and more ‘pla. Just so much beautiful ‘pla on display, it hurts. 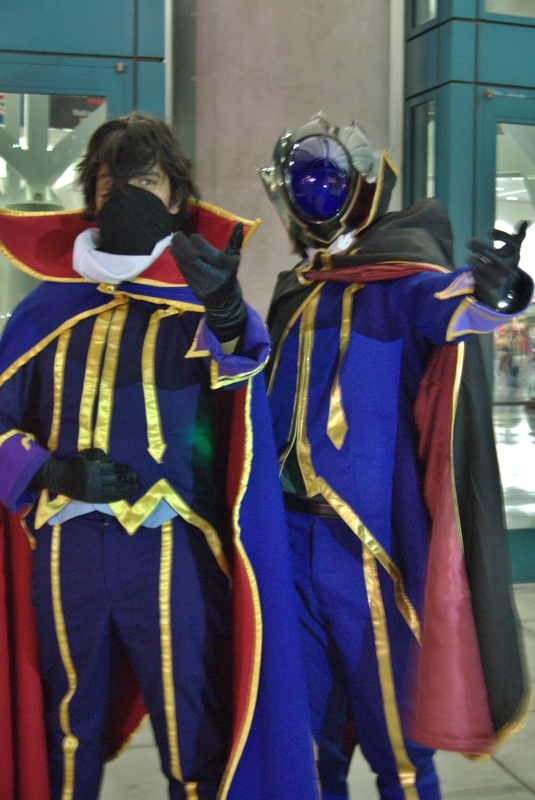 And some more great cosplaying. The palette for these is very large; people from all sorts of backgrounds and with all sorts of interests, coming together under one roof. As a big Iron Man fan, thought this was pretty awesome. Good to see that we had at least one at the ‘con this year. 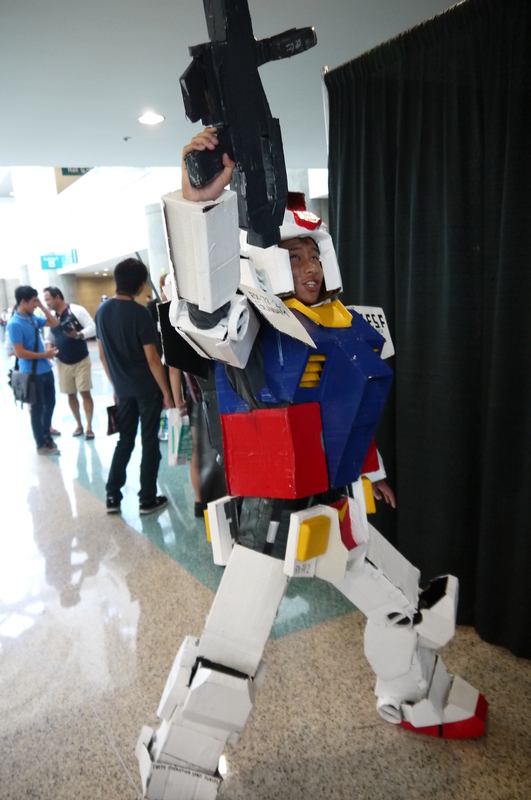 So all throughout the convention, my colleague was hell-bent on finding another fully armed-up Gundam like himself. 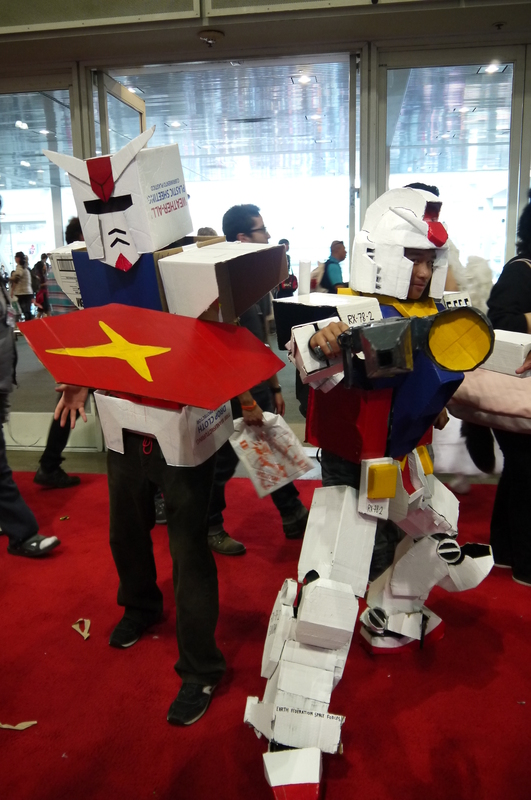 We didn’t have much success at first; surprising that cardboard Gundam costumes are so few and far in between. I figured if two meek high schoolers like ourselves could do it, anyone could. 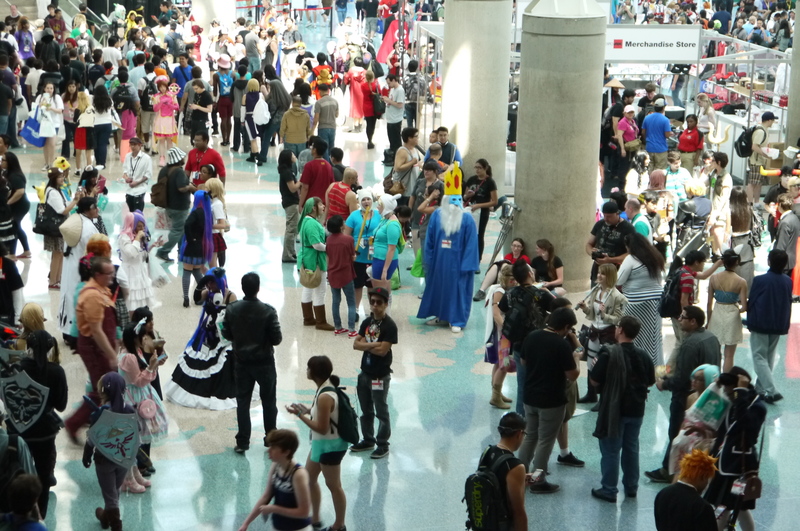 Just a little more of the Exhibit Hall…and a tragic Halo figure with a backwards bazooka. 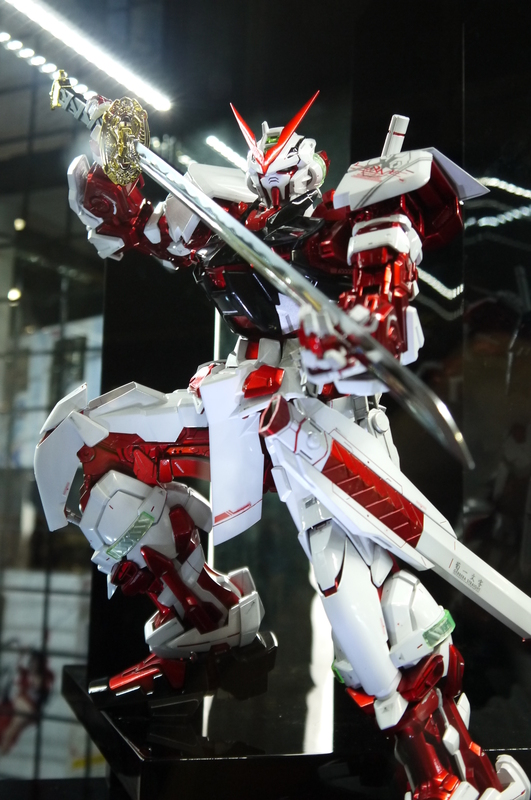 Some beautiful Good Smile Company stuff…specifically Braku Rocku SHOOTAH. 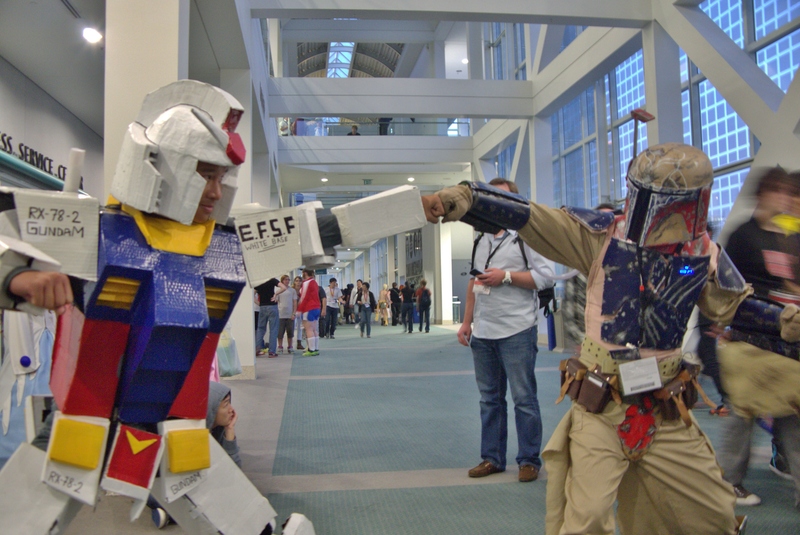 A little more of the RX-78-2 in action. There was a giant Panzer tank in front of the convention center when we first came in from the front. Not a big fan of it, nor do I care much for it, but my cameraman buddy has a huge thing for weapons, tanks, and girls with guns. 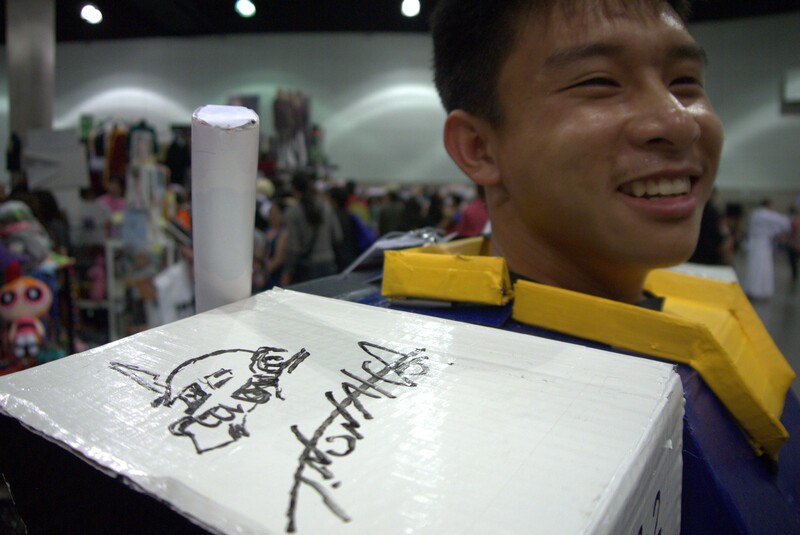 Upon seeing him again at AX, we had him sign my partner’s shoulder armor. And this kind-hearted fellow agreed to happily. 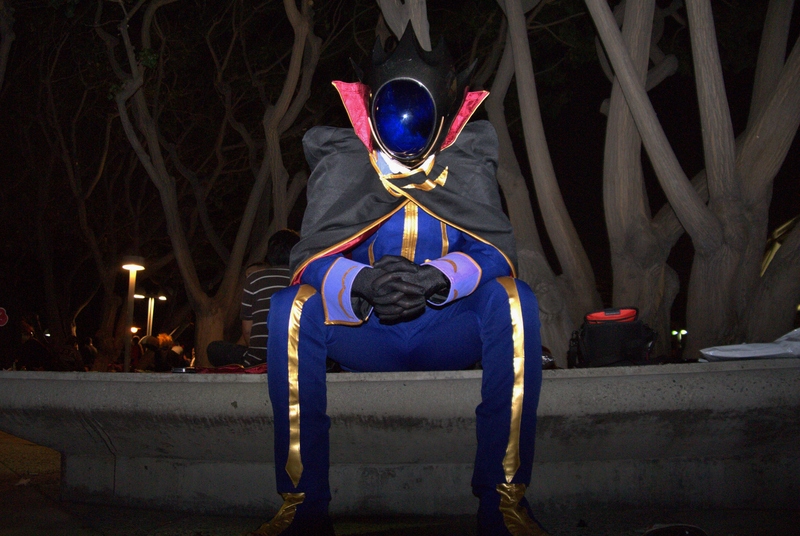 So what of me…attended with my Zero outfit as planned, and I have to say, it worked out quite well. Got a lot of photo requests this year, much to my own gratification, alongside my partner in his armor. 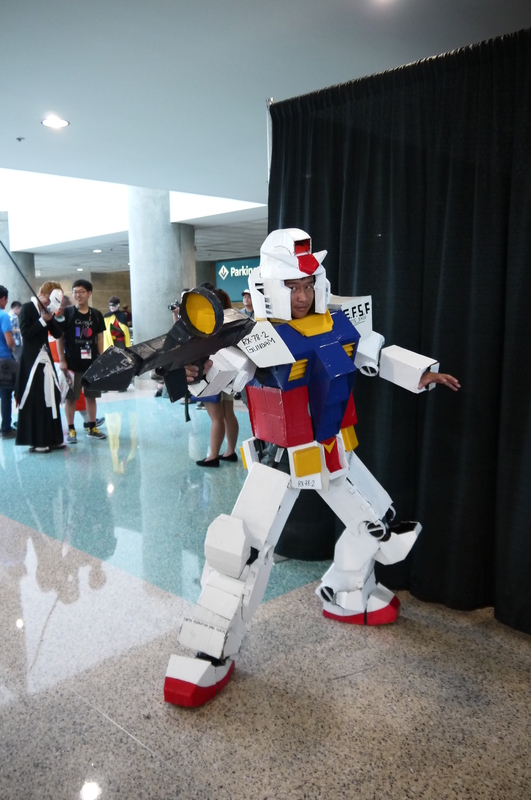 A really funny thing that both my comrade and I noticed throughout the day was that most of his photo requests came from older fellows, mostly males, who’ve most likely seen the original Gundam, and would therefore be the most familiar with the RX-78-2’s design. I, however, seemed to attract many more females than males asking for pictures. A hilarious notion at the end of the day when we looked back on it. It actually wasn’t too bad wearing the entire garb throughout the day; the only part of me that got really hot and sweaty was the white neck wrap. Essentially I’m covered from head to toe when I have my mask on, so I expected it to be a lot worse than it was. It was a real ego-stroker to have people complement the costume. I smelled something really awful the entire day in that thing though. Standing three hours in the heat didn’t exactly help the situation. 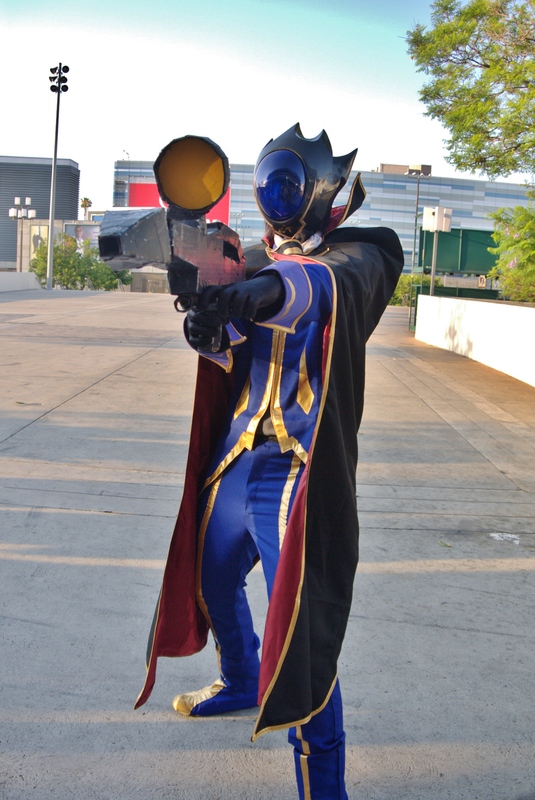 There were actually several other Zeros there at AX; surprised that it’s such a popular character. Went ahead and troubled one of my twins for some poses together. Stole my comrade’s choice of weaponry for a little bit. Pew pew. Armor brofist. We know what it’s like, we share each others pain. A few more fabulous cosplays. Some of these people pull them off really well. We thought we saw a really good Black Gold Saw last year, but this year’s takes the cake. And to top off the day we attended the infamous Huke’s panel and interview. He’s a very entertaining fellow, and a stupidly talented artist. I don’t understand how people like that can draw so well, so quickly. But overall, that was Day 1. Honestly it was more than I could have ever wished for it to be, an Independence Day very well spent. Looking very forward to two more days here, drowning in animu everywhere. Congrats! So glad they all came together successfully! You all look great!